Kurt Thiele and Suzanne Roberts offer a warm welcome and good coffee to anyone who stops in at Café Logos. Next time you’re driving along Kingsway, look out for signs of the Canadian Bible Society (CBS), past and future. Their name is still prominently displayed on the old shell of a building they used to occupy at the corner of Kingsway and Fraser. Drive five blocks further east though, and you will see signs of their new Bible Centre and Café (1207 Kingsway, at Inverness). But the closure and sale of its high profile headquarters at Fraser and Kingsway in 2016 has reduced the Bible Society’s visibility in BC. The signs are still there, work has continued, but the building is empty. The new location up the road will no doubt change that. The space is much smaller, and there are fewer books and Bibles. If you drop in, you will see Bibles, certainly, but what you will experience first is the inviting smell of coffee in Café Logos. Kurt Thiele is supervisor of the new Bible Centre / Café, which has been open since last fall but will have an official launch this spring. 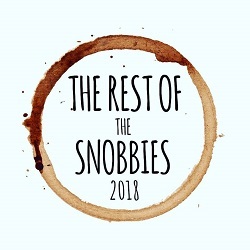 Thanks to Vancouver Coffee Snob for featuring us in their Snobby awards! We won the award for “coffee shop I bet you’ve not heard of yet”. We hope to change that in 2019! Happy New Year! Thiele, who describes himself as “a bit of a coffee nerd,” says he just wants to get Café Logos off on the right foot, to “do it right.” He points out with some enthusiasm that their supplier, Oughtred Coffee & Tea, based in Delta, won Roaster Magazine’s 2018 Roaster of the Year Award. While rebranding and quality coffee may be important to Thiele, he is very much committed to the historic work of the Bible Society. Many neighbours are dropping by. He notes that the four pillars of CBS work are translation, publication, distribution and engagement. He is focusing on engagement, hoping to create “an inviting warm spot” for the community. He says majority of people coming in are neighbours and people walking by. My story with the Canadian Bible Society (CBS) goes back to about 10 years ago. I wasn’t a Christian at the time, but my father was. He is also a cyclist and has been involved with CBS’s ‘Bike for Bibles’ program for some time. I have to admit, I’m not much of a cyclist, but I was drawn to the incredible trip they had planned, cycling from the Lower Mainland all the way through the Rocky Mountains to Calgary. Kurt Thiele (left) and Russell Murray (CBS regional director) were joined by Duncan Campbell and Justin Kelsey from CBS head office in Toronto, out for Missions Fest. “What a great way to experience the Rocky Mountains!” I thought to myself. Little did I know how impactful that trip would be for me spiritually. I came away from that trip with a strong desire to read the Bible. And so I did. That led me to being the Christian I am today. Initially, I volunteered for CBS, helping out with preparations for the exciting new re-opening of the Bible Centre and the launch of CBS’s first Bible Café in Vancouver. I’m now happy to be officially on board, seeing things through as the supervisor. More about the Canadian Bible Society’s work at the time of their official launch. In the meantime, check out their Facebook page, visit them at Missions Fest – or better yet, drop in for a coffee. I’d love to hear about other church-based coffee shops. I know House of James has one up in Abbotsford, but I’m sure there must be others I’m not aware of. Thanks for the update, Flyn. Just tried it out and they have good coffee at Cafe Logos! Another one to add to the list is Hive Cafe on Front Street in downtown New Westminster, run by Five Stones Church. Mennonite Heritage Museum serves coffee and desserts. It just started making soup. Everything is reasonably priced so that for less than $15 two people can have soup and coffee or for less than $20 add dessert as well. It’s about $6 for two to have dessert and coffee. All homemade – all of Mennonite Heritage. Take time to visit the Museum (by donation) as well.